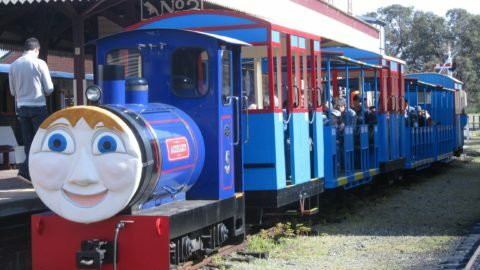 Events in November – if you’re looking for family-friendly events and activities for the month of November, then Buggybuddys has you covered with a list of events that is bound to have something to interest everyone. WA’s world-class light & illumination festival is BACK for its biggest & brightest year yet! KALEIDOSCOPE returns to illuminate Joondalup City Centre for its third year with an awe-inspiring array of electrifying installations, live performances, mouth-watering food & more from Thursday 1 – Sunday 4 November 2018. Over four magical evenings, Joondalup City Centre will transform into an interactive, living & breathing entertainment hub – the true vision of a ‘Future City’. MUSIC + FOOD from 5pm // LIGHTS ON from 7:30pm-10:30pm. KALEIDOSCOPE is a FREE, family-friendly event welcoming all to experience the wonders of illumination! Don’t forget to use #Kaleidoscope18 on all your festival snaps! Join us as the sun goes down and watch Garvey Park come alive and burst with colour, light and sound! This event will see local artists and designers use modern technologies to indulge the senses and create an illumination like no other. Big Light Out will take you on ‘A Twist through Time’ and explore the best music of the decades with a laser, light and effects show that is sure to leave you awed. Why not join us for an evening of brightness, feast from one of the quirky food trucks, take a spin on a carnival ride, and relax in the park which will be glowing for this event. With a jam packed line-up of entertainment and interactive art installations, be ready to be amazed with a BIG LIGHT OUT to launch the 2018 Let’s Celebrate Festival. This event and its activities are FREE and no tickets are required. Costs only apply to purchasing food and beverages from the food trucks. Perth! Halloween like you have never had it before! Big Fish Little Fish is getting its spook on and heading to Perth for a Family Rave unlike Perth has seen before. Binary Finary are your DJ Duo, Dr. Jekyll and Mr Hyde bringing a set filled with classic rave and classic trance anthems. Bar1 (formally Scion) at Hillarys is the nightclub where we get our scare on. There is a big car park directly outside the nightclub to park your broomsticks. For families with younger children (8s and under) though all ages are welcome. Adults are not admitted unless accompanied by a child. A max of 3 children per adult. If there are more than 4 adults per child in your group please email [email protected] for pre-approval before buying tickets. Please event details for terms and conditions. We are super excited to bring you a special POP-UP MARKET at Primewest Northlands featuring some of Perth’s best handmade local creative designers of gift wares, clothing, accessories and more! We’ll create a market vibe with live music and provide something fun for the kids too! Expect a vibrant atmosphere with FREE face painting for the kiddies – ALL while you shop for something unique! COME JOIN US for this wonderful opportunity to support local business and snap up something special from a central location. Smoke-Free, Alcohol-Free Family event. Spectacular Fireworks display at 8:30pm. All are welcome. Diwali Mela will have a number of food stalls serving authentic Indian snacks and a wide variety of dishes. The non-food stalls consist of traditional Indian dresses, Henna, Banking and Mortgage services, Spiritual stalls and display of a number Indian small entrepreneurs. The cultural programs include live bands, songs, dances and performances for all ages. Stage performances include Indian and multicultural artists. This year the ‘Make Smoking History Canning Show’ is proudly sponsored by Healthway promoting the Make Smoking History message. Join us for Show days consisting of a full fun sixteen hour stage show, roving entertainment, a variety of stalls, LIVE onsite broadcast with HeritageFM 107.3 and a large sideshow with games, rides and showbags. Saturday the Show rolls on with exhibits put on by the local community, stilt walking fun, face painting, petting farms and an array of activities and demonstrations for the whole family. The Show concludes Saturday night with ‘LIVE AT THE CANNING SHOW’ brought to you by City of Canning – featuring: Adam Hall and The Velvet Playboys, The Bambuseae Rhythm Section and The Merindas. Open Friday 2nd November from 5pm until 10pm. Open Saturday 3rd November from 9am until 10pm. Seaside Scavenge is a waterway clean-up and clothes swap event where the litter collected becomes the currency to purchase quality pre-loved clothes, books and more, that have been donated by the local community. We promote an awareness of single-use plastics, its impact on our marine environments and also focus attention on the impact of the fast-fashion industry alongside local musicians and green groups. Save the date for this fun and free event. Bring the kids and join us for our free, family event at Tompkins Park on Sunday, 4 November 2018 from 10.00am to 2.00pm. There will be arts and crafts activities, amusement rides, kids DJ, glitter tattoos, face painting, bouncy castles, giant bubbles and plenty of food trucks to take care of hungry tummies. Community safety will be interwoven throughout the festival, with Constable Care making a visit along with other community and safety groups manning information stalls. The kids can even climb aboard a police car and a fire truck complete with sirens and flashing lights. Come join us at the Adventurescape Playground in Austin Lakes for our Monthly Lakeside Markets.Nestled amongst the parklands and the gorgeous lake our markets bring you an amazing range of friendly local stallholders showcasing a great variety of wares. From gorgeous handmade creations, to homewares, gifts, experiences and everything in between you are sure to find something that takes your fancy. We also have some amazing foodies and that all-important coffee available. For those wanting to increase their fitness levels we also have boot camp to get that heart pumping. Children’s activities and the amazing park round out your Sunday morning, what a great way to start the day. 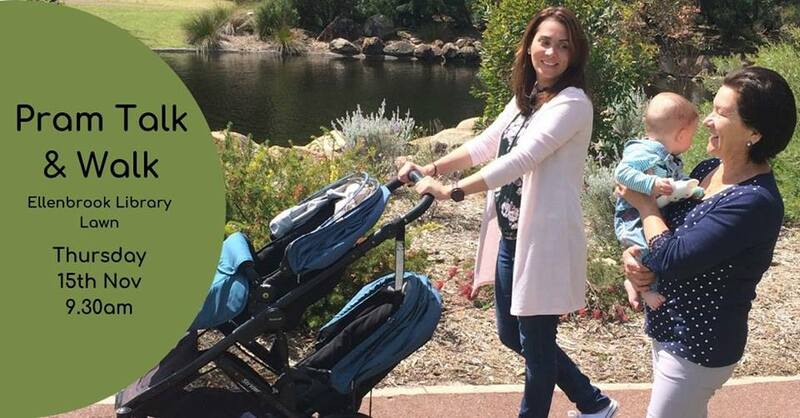 The Perth hills health and wellness providers have come together to showcase and educate the public on the many local services available to meet your needs. Proudly supported by the City of Kalamunda and Echo newspaper. Join the fun and excitement at Fremantle Leisure Centre’s family pool party! There will be land and water inflatables, entertainment and activities for everyone. Tickets $2 payable at the event. Celebrate Deepavali together by the Swan River with friends and family. Enjoy delicious food & beverages by Annalakshmi, watch dance and music performances by local and international groups, including Kabir Café, participate in arts, crafts and workshops, take the kids to fun rides/activities, take a tour through Tamil Nadu and end the evening with fireworks. A family friendly, smoke and alcohol-free event. Announcing the biggest and boldest 2018 Freo Beerfest to date – presented by Fremantle’s most iconic local Brewery – Little Creatures. 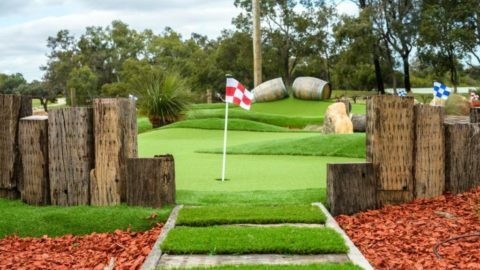 Interaction with the largest range of WA Craft Beers, Ciders, Rum, Whisky and more, along with an exclusive hands on experience with WA producers! Tickets are essential and can be purchased here. The City of Gosnells is proud to present its annual multicultural celebration, the Fusion Food and Culture Festival presented by Act-Belong Commit. An exciting fusion of diverse cultures brings Mills Park to life with global arts and crafts, live multicultural performances, children’s activities, a youth zone, carnival rides, tasty food and a spectacular firework display. Our new and exciting community markets! Rainbow Water park surrounded by lawns and loads of room to kick a footy or just sit and enjoy free live music and the Ellenbrook Lions Club Train (small donation requested). 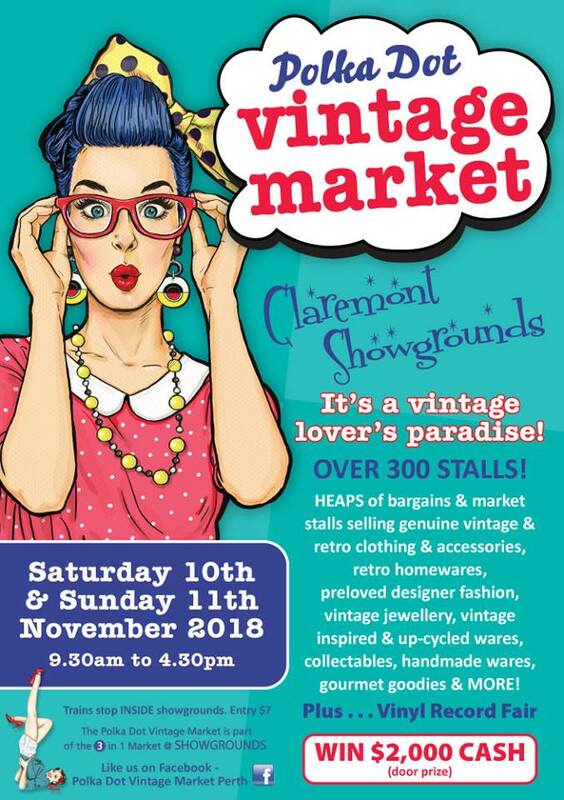 • Browse stall upon stall of Girls & Guys genuine vintage & retro clothing & accessories, mid-century, retro & kitsch collectables, vinyl records, vintage jewellery, vintage inspired and up-cycled wares, retro furniture, preloved designer fashion, handmade wares and gourmet goodies. 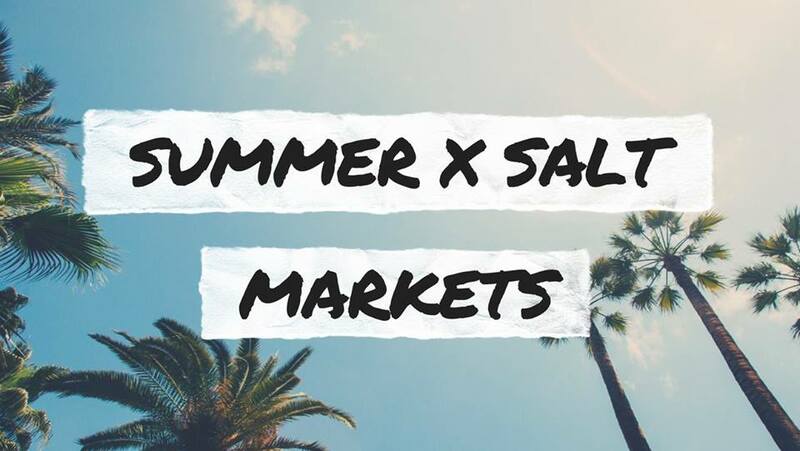 We are beyond excited to bring another series of surf, salty-lifestyle & sustainability focussed community markets. … any excuse to get salty. GET AMONGST IT. GET EXCITED. GET SALTY. Parking available on the reserve, access via Meagher Drive. 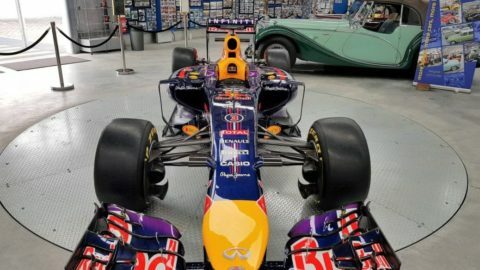 Come and see Ferrari, Lamborghini, Maserati, Alfa Romeo, Fiat, Lancia, De Tomaso, Ducati, Moto Guzzi, Lambretta, Vespa & more. Over 200 classic vehicles, vintage to new – the cream of Perth’s Italian cars and motorcycles will be on display. Not sure what to do with the kids while you’re looking at the cars?! Don’t worry – we have you covered! There will be a bouncy castle and face painting on the day! Also, kids are free entry! So why not score some brownie points with the kids (and maybe your spouse?!) and bring the kids along! All profits go to Northbridge Rotary Club and their community projects. (save $5 on the gate price), children FREE! Go to https://www.trybooking.com/YBPE to secure your tickets now! Let’s come together and talk about being a new parent. Join us for a walk around Charlie Gregorini Memorial Park then head back to the library for coffee and a catch up. We’ll chat about what matters to you. FREE coffee and ice-cream on registration. FREE children’s games, face painting and activities. Wear your comfy shoes & bring a big hat. The 104th Osborne Park Show is now on again on the weekend of Friday November 16 & Saturday November 17 at Robinson Reserve Tuart Hill. All the fun of show returns in 2018 with free demos on the Arena, eight City of Stirling schools on the main-stage, two sheds of fur and feathers, craft and produce exhibitions, show bags and rides in sideshow alley and of course the legendary fireworks are on 9pm each evening! Tickets are now on sale for the 104th Osborne Park Show at Robinson Reserve. Choose the buzz of the opening evening of Friday November 16 or the superb family value on November 17! All your carnival favourites like show rides, show bags and agricultural displays return in 2018 along with a bumper edition free demonstrations, bands and local entertainment. There is even more seating and shade on the Arena this year with great food options, ATM’s and a pop up bar nearby. Opens Friday from 6pm, and Saturday from 11am. The Made on the Left 2018 Christmas Market will be held at Princess May Park, Cantonment St Fremantle, on the 17th & 18th November 2018, between 9am and 5pm both days. Come and help us celebrate our 10th year of being Perth’s longest running designer market. For those of you salty crew that haven’t heard of what we do, listen up. Thanks to the support of City of Busselton there’ll be live tunes from local musos to lap up, conversations with local green groups to be had & all round change making action to get in on. With 63 billion gallons of oil used annually in the US to produce plastic bottles, there’s more to the plastic pollution issue than just cleaning up. So get ready to do more than just recycle, it’s time to give single-use plastic the boot, start purchasing quality made garments over cheap synthetic ones and all round become a conscious participant on this planet. If you love great food, culture and live music, then these markets are for you! As we head into summer it’s a perfect excuse to take a night off cooking and eat out with your family and friends. Set in the leafy surrounds of Memorial Park, it’s the perfect place to bring the kids as they can play in the newly redeveloped adventure playground and run around on the grassed area in the large amphitheatre. Indulge in exotic cuisines from a variety of food trucks, then sit back and enjoy live music and performances inspired by different cultures of the world. This is a free event, refreshments available to purchase from the food trucks. 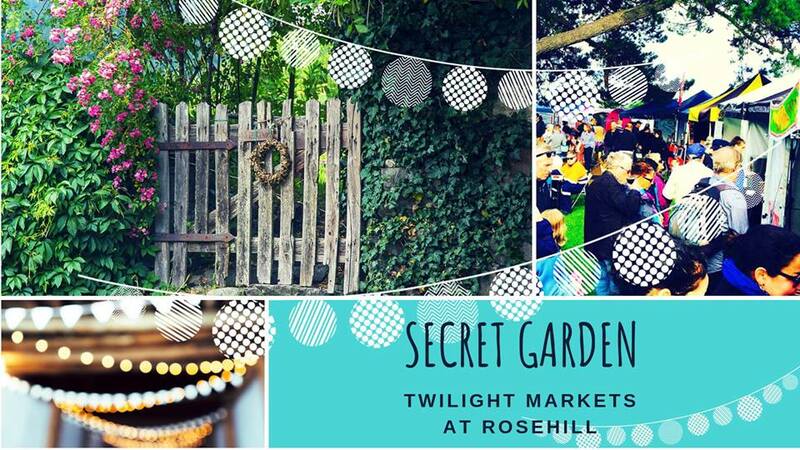 This Summer series of twilight markets is set in the shady secret gardens surrounding the iconic Rosehill Lodge in South Guildford.Browse our stalls amongst the shady trees and grab a bite to eat from the row of food trucks parked just outside.There will be live music to enjoy while you eat, and free pony rides for the kids. The Muddy Hands Festival is an event to encourage children and families to enjoy playing outdoors and being among nature, bringing unstructured play into their everyday lives and enjoy City of Canning parks. Kids will enjoy building cubbies and forts; take part in mud play, create nature crafts, learn about camping and loads more activities to get those hands muddy and those imaginations stretched! This event is partnered with Nature Play WA and AWESOME Arts to bring a creative flair into the lives of our children. Interested in Nature Playgrounds? The City has one in Bannister Creek Park! Entry is free, but registration is essential – Book your tickets here. The 22nd annual Mindarie Festival is almost here! The Mindarie Festival will be held on Sunday 18th November from 12pm – 5pm and it is a free family-friendly event celebrating our local community. It’s a safe, fun and exciting day for the whole family! Proudly supported by the City of Wanneroo. The Veteran Car Club of WA (Inc) and the Immaculate Heart College Parents and Friends Association, are excited to host the 2018 Chittering Car Day and Markets. This family event will be held on Sunday, 18 November 2018, from 9am to 3pm, in the grounds of Immaculate Heart College, Lower Chittering. With an estimated 200 vintage and classic vehicles on display, over 60 market stalls from local businesses, producers and community groups and food trucks, KIDS ZONE and live entertainment, this event has something for all members of the family. Thank you to our sponsors Fleet Integrations, AutoBahn Midland, Shire of Chittering, Teresa’s Tasty Treats. 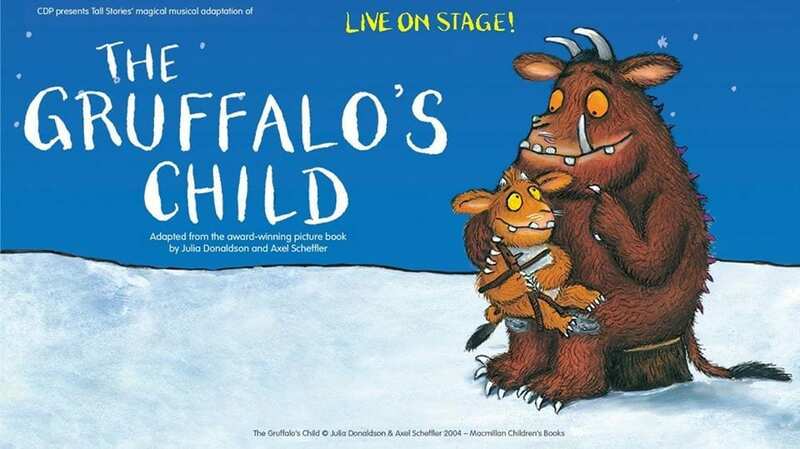 The Gruffalo’s Child arrives at STCWA this November! 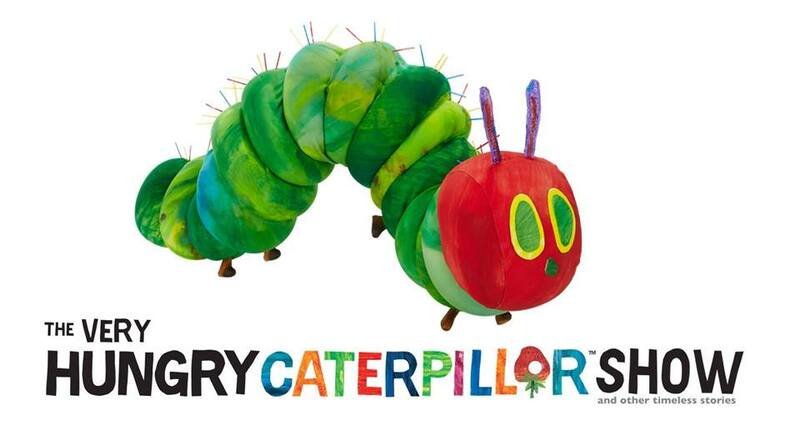 After a sell out season in 2017, ‘The Very Hungry Caterpillar Show’ returns in a masterful theatrical experience for the whole family! * Children aged 2 and over require a ticket for this performance. Bookings essential – tickets available here. Our Community of Wanneroo comes together to give you a taste of our local arts and crafts, businesses, food stalls, coffee retailers rides as well as the Goats, Horses, Birds and Spectacular fireworks on both evenings. We are calling all Avo-Enthusiasts for the freshest celebration in the Perth Hills! The Araluen Avocado Festival will be held in the beautiful surrounds of Araluen Botanic Park. The festival will celebrate all things Avocado including stallholders selling fresh produce, a vast range of products from skin and beauty care to delicious beers and cocktails and chefs demonstrating how to make Avocado creations at home! We will have live music entertainment, fun activities for the kids and Horticulturalists providing you with the expert knowledge you need to grow your own Avocado orchard at home – AND you can purchase your trees on the way out. Running on the 24th and 25th of November, you can purchase your tickets at the Entry Gate upon arrival. Join our reptile workshop to learn about snake behaviour and snake bite first aid. Tickets $5 – Register here.As the temperature increases our native snake species become more mobile. Avoid snakes by sticking to paths, trails and walkways. Should you encounter a snake, remain calm, leave it alone and slowly back away. Be a responsible pet owner and protect your pet by exercising it on a short leash when walking in natural areas and keep your cats indoors. If you find a snake in your home or garden contact the Wildcare Hotline on 08 9474 9055. For more information visit the City’s website cockburn.wa.gov.au/Snakes or call 08 9411 3444. Each month we’ll be popping up at The Square Mirrabooka with some of our amazing food and boutique/craft stalls.Located outside Woolworths in the Fresh Food mall. One of Perth’s favourite and longest-standing community events is returning again in 2018. 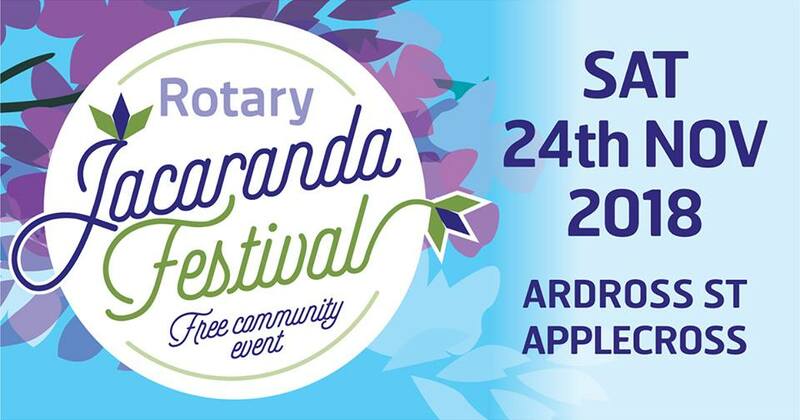 The Rotary Jacaranda Festival will feature 140+ stalls, an array of food options and a unique line-up of entertainment and a buzz of excitement that comes when thousands of people come together. It’s an unmissable day out and a great place to kick start your Christmas shopping, supporting small businesses, local community groups and other causes all at the same time! Let’s get readyyy to rumbleee! It’s timeee for the veryyy first WA BBQ Day to celebrate all things BBQ in Western Australia and have a day and night of festivities, with some melt in your mouth, succulent, woodfired BBQ and of course, a few drinks to wash it all down, with people that share the same passion and love of BBQ. The legends from Big Don’s Smoked Meats and Molly’s BBQ Smokehouse will be your hosts for the evening, turning out a buffet style meat fest, to take you to BBQ heaven. This event will also be a fundraiser, as we would like to do our bit for the farming community, with part proceeds of the event to go to the Red Cross Disaster Relief And Recovery Appeal. The event will be BYO, so to keep costs down and make it affordable for the average family. All day passes are $55 per person plus booking fee, which includes the day activities and dinner. Kids under 16 are FREE!!! This will be the very first WA BBQ Day celebration to share the love of BBQ, so we hope that everyone can make it down to have an amazing feed, chat with and meet some awesome people and find out what the BBQ community and BBQ Family, is all about. Stroll through the lush gardens  cross the troll bridge if you dare find a new favourite product or see your regular hand-made makers. Bounce high into the sky or watch your little ones become a tiger or super hero with our brilliant face painter. Enjoy your coffee while you indulge into a novel from our library surrounded by luscious greenery. The Collector Zone fair is held every 3 months at the Craigie Leisure Centre. We fill a huge hall and we bring in sellers from all over Perth! A great day out for the whole family! Some items you will find at the fair: vintage, modern & retro collectables & toys, Walking Dead, Game of Thrones, Pop! Vinyls, Hot Toys, Comics & graphic novels, Transformers, Star Wars, Batman, science fiction collectables, Doctor Who, statues, action figures, loads of Lego & Lego displays, anime figures & collectables, Pokemon, Local artists & writers – way too much to list! As another year comes to a close, Playgroup WA will again host its free family fun day for kids 0-5 years, celebrating all things PLAY. Our Annual Fun Day is Playgroup WA’s thank you event for all the support and passion our playgroup families invest each day across the state to make playgroup such a great experience. So get your playgroup together and celebrate a year well spent with an enjoyable day out with the whole Playgroup WA community. All attendees will also have the chance to WIN one of two amazing prizes! Second Prize: A Term Pass to Jungle Sports! The market will run from 5pm to 8pm inside & outside the Gary Holland Centre!